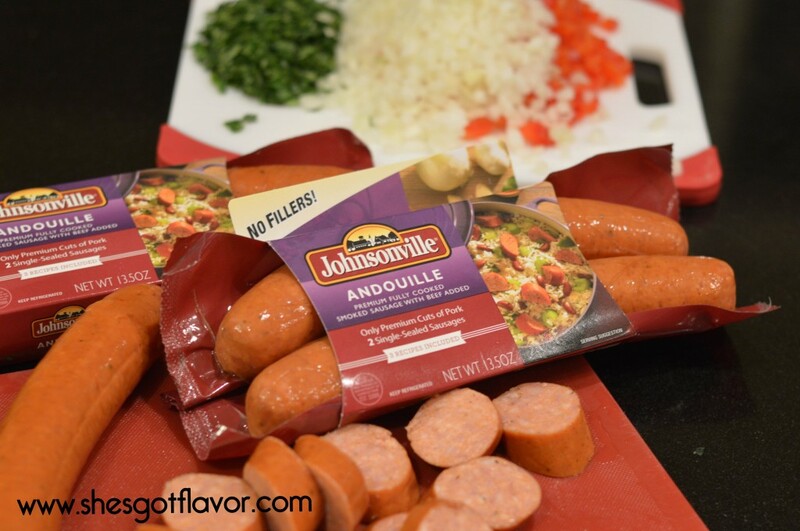 I love all Johnsonville Sausages but I’d have to admit their Andouille Smoked Sausage is one of my favorite. In second running would be their Beddar with Cheddar Smoked Sausage Links (my family and I love them fresh from the skillet for breakfast). I love that they are both fully cooked so I can get them on the plate quickly! Did I mention Johnsonville Sausages doesn’t have ANY fillers? YEP, so I felt guilt free serving it up to the ones I love! 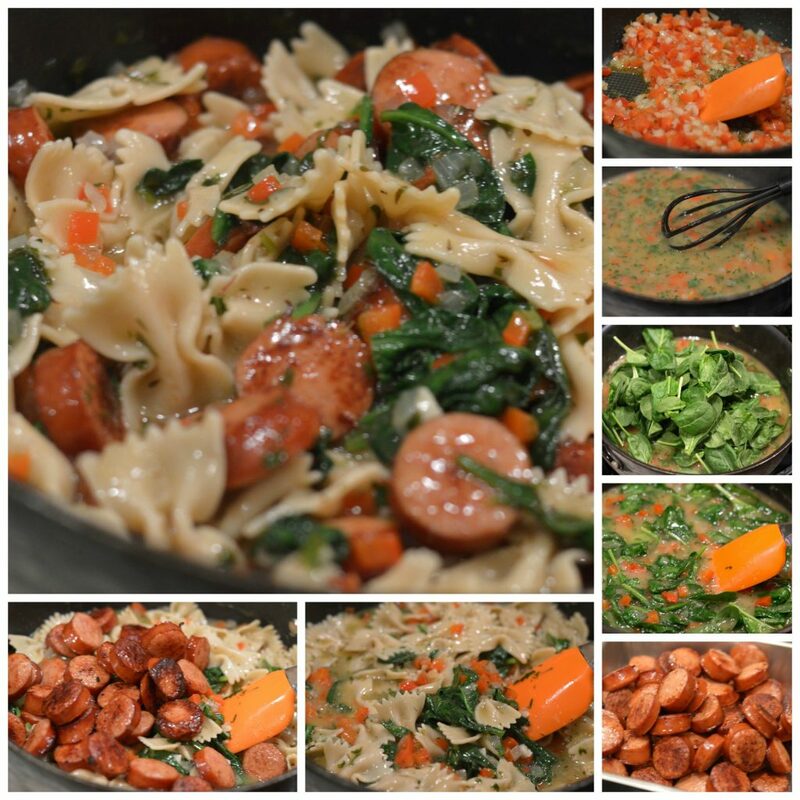 So there I was in my kitchen with a couple packages of the Johnsonville Andouille Smoked Sausage split ropes and not much time before I had to feed my family. Then inspiration hit me and I said to myself … Self this smoked flavor would surely go great with a white wine reduction sauce and what about some spinach and other veggies to make this a flavorful and fulfilling dish! Well as I normally do I got all creative with it, flavoring up, throwing in, whisking and of course hitting it with some love and BAM POW KABOOM! Yeah BABY, home run! 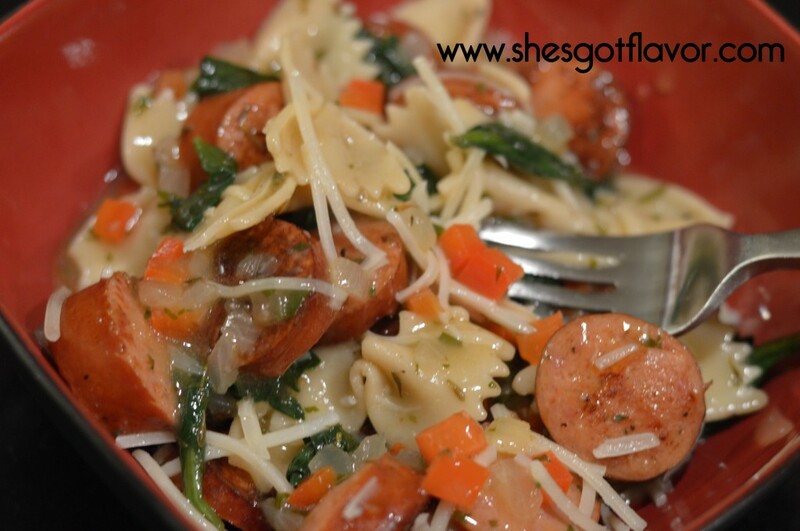 The flavors in this dish will have you going back in for seconds and thirds! This was the perfect midweek meal that my family enjoyed. It was perfect right after a full day of work and school! I even packed some for lunch the next day and had it for leftovers the next evening! But there were no complaints, well there was one complaint ~ when there were no more left LOL! AND I only had ONE pot to clean when it was all done! I love it when there is only ONE pot in my sink! 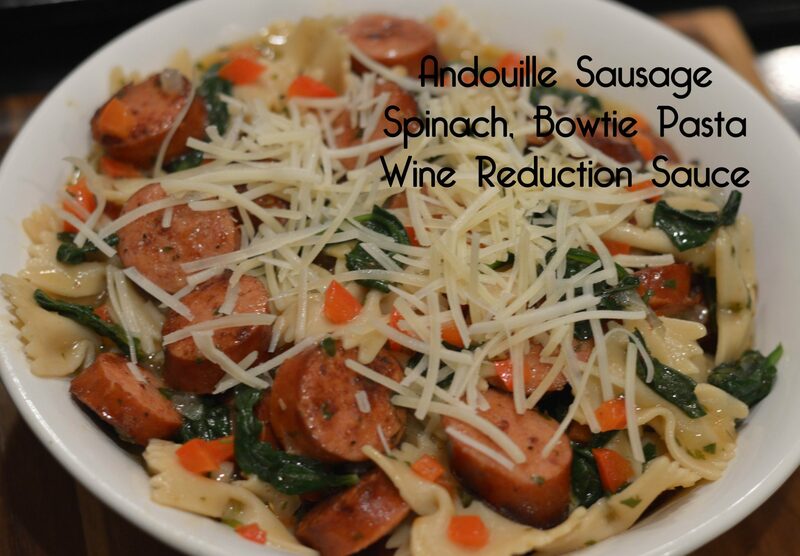 I hope you try this delicious dish and other delicious recipes from Johnsonville. Every Great Meal Begins with Great Ingredients! A Bit of Work in the Kitchen Equals Happy Taste Buds! My Second Serving ~ WHAT?!?! Don’t Judge Me It’s That Good! Do not turn heat off on skillet, add unsalted butter, onions and red bell peppers, allow to Sautee for 4-5 minutes. Add chicken broth, white wine and turn the heat to high. Once boiling add corn starch mixture and whisk together and allow to cook 4-5 minutes on high heat. Turn heat to low and allow sauce to thicken for 1-2 minutes. 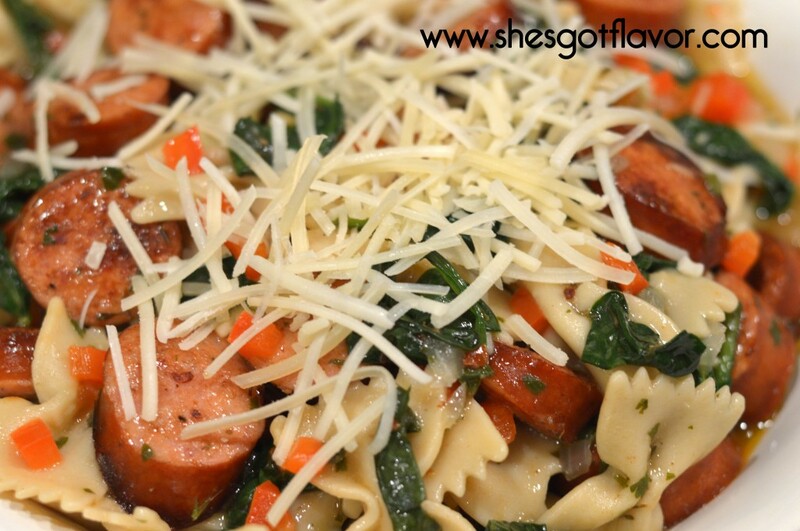 Once sauce has thickened, fold in spinach, and stir 1-2 minutes or until spinach is soft. Add bowtie pasta, Johnsonville Andouille Smoked Sausage, sea salt, black pepper, granulated garlic and fold all ingredients together. Allow to simmer on low 1-2 minutes so the flavors can marry. Thank you for sharing such a delicious recipe. My family truly loved Andouille smoked sausage meal. They devoured it, one thing it didn’t mention when to add the cilantro but I figured it out. Thanks again, look forward to trying your other recipes. do you have to use the white wine? i have never cooked with wine before so not sure of a good brand, can you recommend one? Hello Linda, It doesn’t matter which brand of wine you use, you can even use “cooking wine” from the grocery store. But I used one I had on hand which was Pinot Grigio. I have also used Chardonnay in past.